Lakeside views along the Left Loop at Tsali. Narrow, fast singletrack winding along the shores of Fontana Lake. An absolute classic, and some of the flowiest mountain bike trail in Western North Carolina. There are four trails to choose from. These trails are at a relatively low elevation, compared to the surrounding mountains and the nearby Pisgah National Forest, so it can be hot in summer. Expect a crowd during summer weekends – honestly, it can be crowded during the week as well, but the trails are only this popular because they’re so fun. 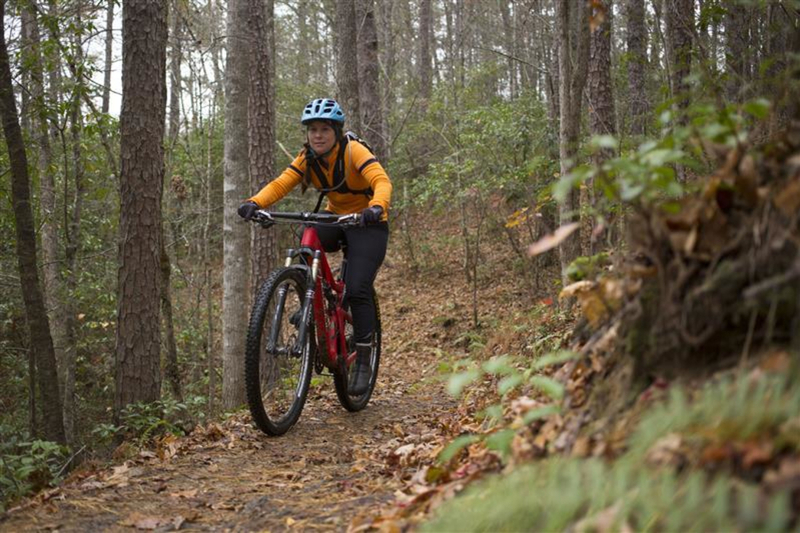 The majority of North Carolina mountain bike trails are known for steep climbs, steeper descents and some truly bone-jarring terrain. What sets Tsali apart from this paradigm is exactly what makes it a classic: fast, narrow singletrack with an old-school feel but plenty of new-school flow. 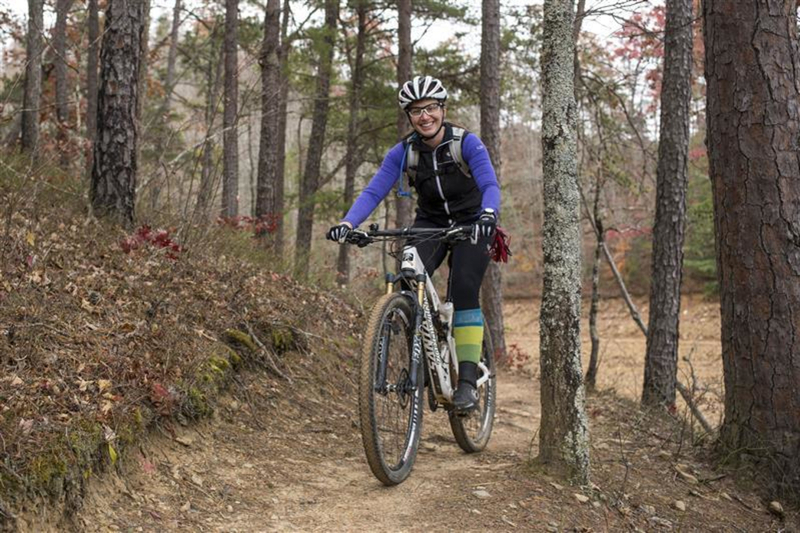 Its reputation as one of the southeast’s best mountain bike rides is well-deserved. The four trail loops at Tsali Recreation Area are grouped into pairs, with one pair or the other open to mountain bikes on a given day. If you have your heart set on which you want to ride, you’ll have to pick the correct day of the week. If you want to ride everything here, you’ll need to make a multi-day trip (see below). While some maps show a “recommended” direction for mountain bikes, these trails are not directional. 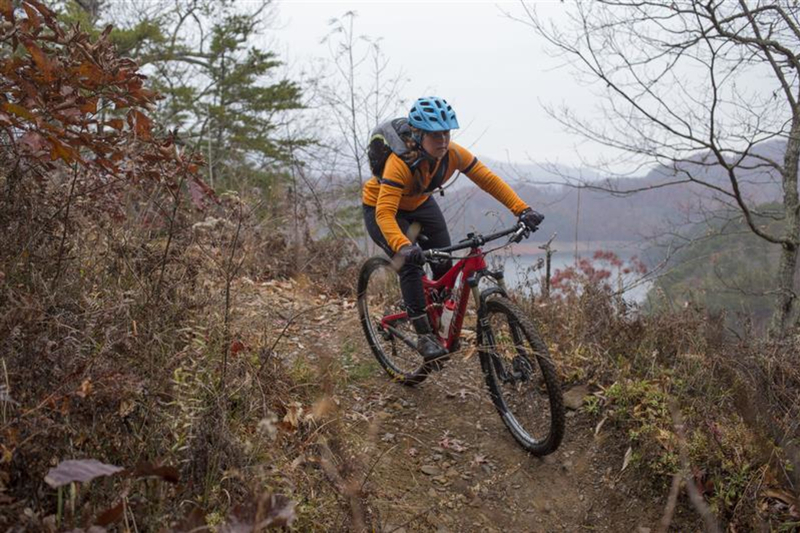 Along with Jackrabbit Mountain, Panthertown Valley, Hanging Dog (Ramsey Bluff) and the relatively-new Flint Ridge trails, Tsali is one of precious few trail systems open for mountain biking in the Nantahala National Forest. 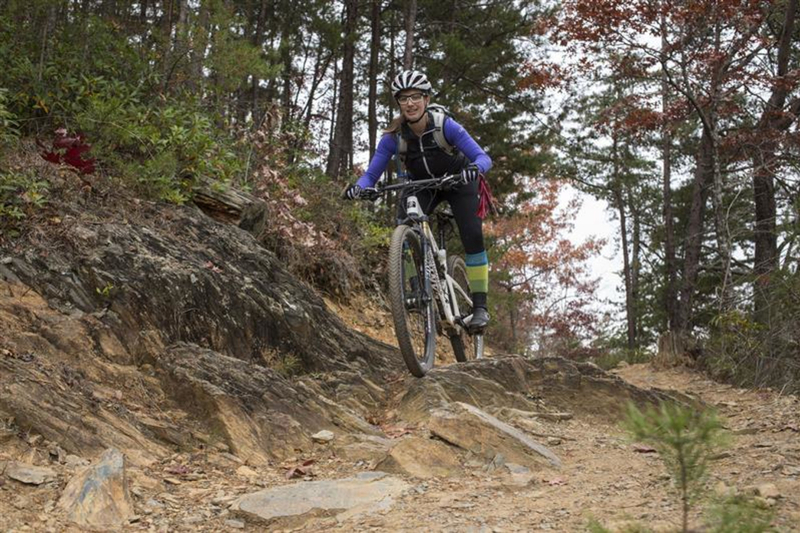 It’s a popular destination ride for mountain bikers from Asheville, Knoxville, Brevard and as far away as Chattanooga. The combination of Left Loop & Right Loop is a designated IMBA “Epic” ride, though the total claimed length of 23 miles is a little misleading; each loop includes a shared 2-mile stretch of gravel road which returns to the trailhead. Unless you’re pressed for time or only wish to ride one of the two, we recommend riding all of the Left & Right singletrack as a single, 18-mile loop around the perimeter of the peninsula. This distance can be trimmed slightly if you prefer not to include the small side loops, which access a couple of nice overlooks. Both trails earn their Epic designations immediately, with miles of twisting singletrack etched into the lakeshore slope. Right Loop is the supposedly the easier ride of the two, according to the USFS brochure, but we can’t tell the difference; perhaps the “easy” rating is due to the fact that Right can be shortened to a 4-mile loop or an 8-mile loop by using the two available connector trails. These trails average 12-18” wide, with some short, punchy climbs but nothing too prolonged. Some sections of Left Loop feel especially narrow and precarious, but predictable surfaces and some recent trail work mitigate any real danger. Be sure to stop periodically and take in the lakeside view; it’s hard to sneak a glance while riding without sailing off the trail! Mouse Branch and Thompson Loop have a completely different “feel,” although both continue to outline Lake Fontana. The two are also a bit easier than Right and Left Loops, in both elevation change and technical difficulty, making them great options for beginners. Mouse Branch, the longer of the two loops, can be ridden and enjoyed in either direction. Terrain ranges from fun, twisting, roller coaster-like singletrack to wider doubletrack on old road beds. Roughly halfway through the loop, you’ll have the option to ride out to a nice overlook of Lake Fontana. The overlook loop is directional (counter-clockwise) and increases the technical difficulty of the trail. You’ll climb to the overlook, with the last bit consisting of a couple tight, punchy switchbacks. Immediately after the overlook, you’ll begin to descend fun, chattery singletrack as you work your way back to the main loop. The overlook loop is not recommended for beginners – don’t worry, you’ll have plenty of opportunities for great views of the lake! Although non-directional, Thompson Loop is generally ridden counter-clockwise to take advantage of the screaming downhill at the end. This is the best descent at Tsali. The loop is a bit shorter, mostly smooth singletrack, and has no trail intersections. It’s easily navigable by beginners. If riding counter-clockwise, you’ll begin by descending, winding through a series of small creek crossings while catching glimpses of the lake through the trees. The terrain changes from rolling to decidedly uphill, and you’ll top out your climb on an obvious old road bed. Abruptly shifting downhill, a very sharp right hand turn spits you back onto the singletrack where you’ll weave through trees and float over roots as you make your final descent back to the Tsali Campground. The climbs and trail surfaces are moderate, but mountain bikers of all skill levels will enjoy what the hard-packed Tsali trails have to offer. 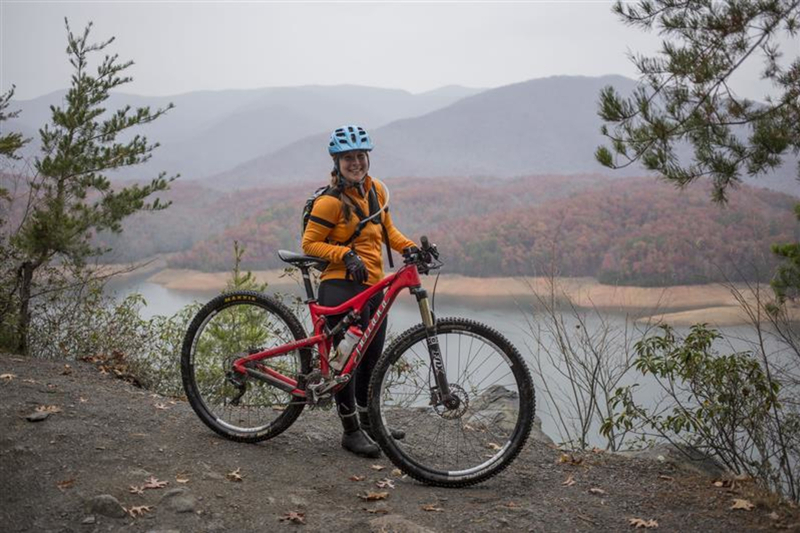 Meanwhile, in a region where forests are thick and views scarce, this trail system serves up fantastic scenery of Fontana Lake and the mountains which surround it – including the southern edge of Great Smoky Mountains National Park, on the other side of the lake. 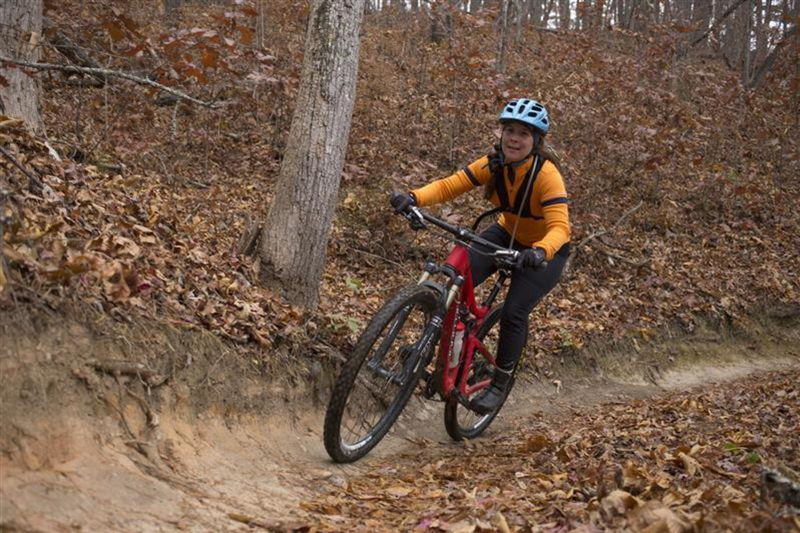 The Left Loop Trail & Right Loop Trail are open to mountain bikes on Sunday, Monday, Wednesday and Friday; Mouse Branch Loop Trail & Thompson Loop Trail are open to mountain bikes on Tuesday, Thursday and Saturday. On days when these trails are closed to cyclists, they’re open to horses. This is a popular area for both user groups, so be sure to read the trailhead signs and honor the schedule. Hikers and trail runners can use any of the trails at any time. There is a $2 day use fee to ride these trails, payable in cash via a deposit box at the main parking lot. The trailhead includes pit toilets, changing room, picnic tables, drinking water and a bike wash. The Tsali Campground is first-come, first-served, with showers and flush toilets available from April 15 through October 31. This campground remains open in winter, with a reduced fee, but water is not available during the winter months. Fishing is permitted year-round, and there is no fee to use the boat launch near Lemmons Branch. The lake is also a great spot for flatwater kayaks, canoes or stand-up paddleboards.